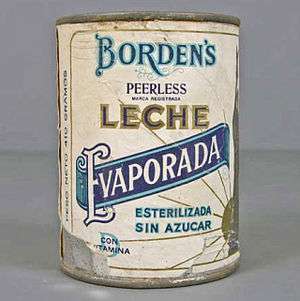 Can for Borden's evaporated milk from the second half of the 20th century. From the Museo del Objeto del Objeto collection. The product takes up half the space of its nutritional equivalent in fresh milk. When the liquid product is mixed with a proportionate amount of water, evaporated milk becomes the rough equivalent of fresh milk. This makes evaporated milk attractive for purposes as it can have a shelf life of months or even years, depending upon the fat and sugar content. This made evaporated milk very popular before refrigeration as a safe and reliable substitute for perishable fresh milk, which could be shipped easily to locations lacking the means of safe milk production or storage. The process involves the evaporation of 60% of the water from the milk, followed by homogenization, canning, and heat-sterilization. In the 1920s and 1930s, evaporated milk began to be widely commercially available at low prices. The Christian Diehl Brewery, for instance, entered the business in 1922, producing Jerzee brand evaporated milk as a response to the Volstead Act. Several clinical studies from that time period suggested that babies fed evaporated milk formula thrive as well as breastfed babies. Modern guidelines from the World Health Organization consider breastfeeding, in most cases, to be healthier for the infant because of the colostrum in early milk production as well as the specific nutritional content of human breast milk. Evaporated milk is fresh, homogenized milk from which 60 percent of the water has been removed. After the water has been removed, the product is chilled, stabilized, packaged and sterilized. It is commercially sterilized at 240-245 °F (115-118 °C) for 15 minutes. A slightly caramelized flavor results from the high heat process, and it is slightly darker in color than fresh milk. The evaporation process concentrates the nutrients and the food energy (kcal); unreconstituted evaporated milk contains more nutrients and calories than fresh milk. Evaporated milk is sometimes used in its reduced form; however, to reconstitute evaporated milk to be equivalent to normal milk, mix 1 part by volume of evaporated milk with 1 1/4 parts of water. Where evaporated milk is required but not available, it can be replaced by simmering 2 1/4 parts of fresh milk down to 1 part. A comparable result is obtained by simmering down 2 parts of almond milk. Sections (b) - (f) of the above code regulate vitamin addition, optional ingredients, methods of analysis, nomenclature, and label declaration. It is added in brewed tea and coffee to make Teh C and Kopi C respectively. The C used in the name were due to a common association to the brand "Carnation Evaporated Milk". It is widely used as a whitener (Creamer) for coffee. It is widely used for desserts, added to coffee, tea to create a rich and delicious " Leche con café" or " Te con leche", which is made with half water, half evaporated milk and either coffee or tea and sugar to taste. The shelf life of canned evaporated milk will vary according to both its added content and its proportion of fat. For the regular unsweetened product a life of fifteen months can be expected before any noticeable destabilization occurs. 1 2 "CARNATION FAQs". Nestlé, Carnation FAQs. Archived from the original on 9 February 2013. Retrieved 20 January 2016. ↑ "How does sugar act as a preservative?". BBC Worldwide. ↑ McGee, Harold (2004). On food and cooking: the science and lore of the kitchen. Simon and Schuster. p. 24. ISBN 978-0-684-80001-1. ↑ Marriott, William McKim; Schoenthal, L. (1929). "An experimental study of the use of unsweetened evaporated milk for the preparation of infant feeding formulas". Archives of Pediatrics. 46: 135–148. ↑ Breastfeeding, World Health Organization. ↑ "Evaporated milk". Retrieved 3 February 2015. ↑ "Is there a substitute for evaporated milk". Retrieved 7 December 2015. Wikimedia Commons has media related to Condensed milk. 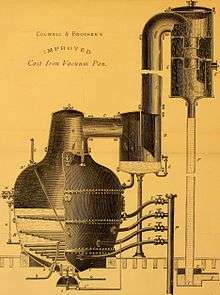 PET History - history of evaporated milk and the PET company.